Friday October 2nd 1903 It began to rain early this morning. I put in the entire day working on my sweater fixing the loops and buttons. Finished it in the evening. Saturday October 3rd 1903 I put down the sitting room carpet and did some baking before noon. Mollie went in town in the afternoon with Mrs Pointain. I put up tomatoes when not hindered by storms. We had [one?] terrible rain. Will went in after mails, &c. I was very tired and went to bed early. Sunday October 4th 1903 I was busy most of the forenoon with the work. I read and wrote in afternoon. Mollie spent the day in her room on account of bad cold. 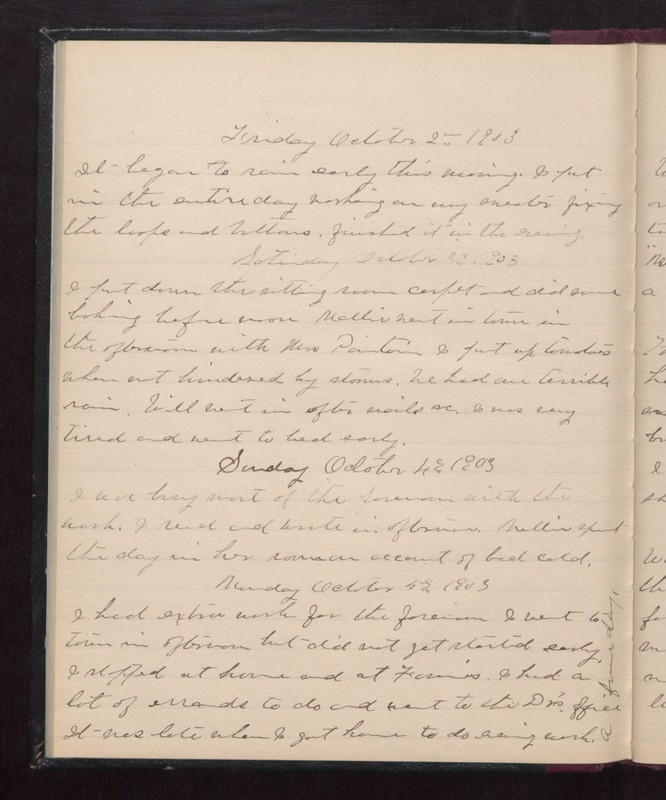 Monday October 5th 1903 I had extra work for the forenoon. I went to town in afternoon but did not gt started early. I stopped at home and at Fannies. I had a lot of errands to do and went to the Drs office. It was late when I got home to do evening work. A fine day.